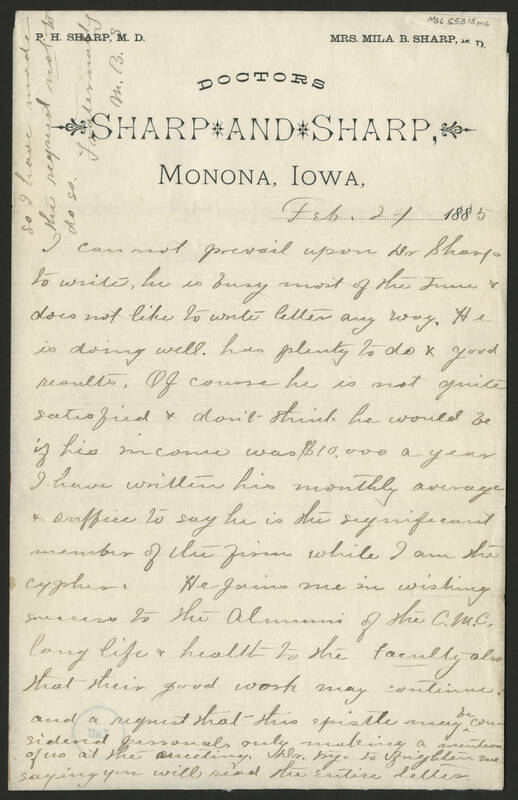 Doctors SHARP AND SHARP Monona, Iowa Feb 24, 1885 I cannot prevail upon Dr. Sharp to write, he is busy most of the time & does not like to write letter any way. He is doing well. has plenty to do & good results, Of course he is not quite satisfied & don't think he would be if his income was $10,000 a year I have written his monthly average & suffice to say he is the significant member of the firm while I am the cypher. He joins me in wishing success to the Alumni of the C.M.C, long life & health to the faculty also that their good work may continue. and a request that this epistle may be considered personal, only making a mention of us at the meeting. Don't try to frighten me saying you will read the entire letter. So I have made the request not to do so. Fraternally M. B. S.